German carmaker Porsche appears to be putting the pedal to the metal with regards to the Taycan’s track capabilities, with multiple pre-production prototypes recently being spotted on the Nurburgring. As could be seen in a video taken earlier this month, several of Taycan’s test mules were spotted taking on the iconic track’s turns and straights in true Porsche fashion. 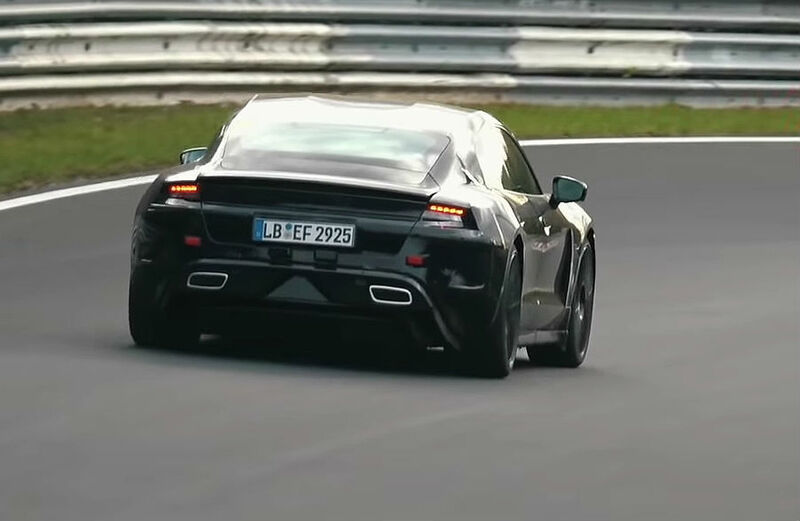 The video, which was taken by auto enthusiast Automotive Mike, shows at least seven Taycan prototypes being track tested on the Nurburgring. Based on clips of the vehicles, particularly the way some prototypes accelerated after navigating a turn, Porsche seems to be refining and testing the track capabilities of the Taycan’s different variants. While all of the Taycan test mules featured impressive acceleration as they hugged the track very well, some of the prototypes seemed to have slight differences in terms of performance. The prototype fitted with the LB EF 2925 plate, for one, seemingly featured electric motors that were a bit more audible than the other test mules, as seen in 0:31 in the video. The prototype with the LB EF 923 license plate, on the other hand, almost appeared like it was moving in a more deliberate manner (2:04 in the video). While these differences might simply be due to the varying driving styles of the Taycan prototypes’ drivers, the non-uniform behavior of the test mules could also correspond to the different, upcoming performance trims of Porsche’s first all-electric car. Porsche, after all, has not announced the specific price of the vehicle, though the Taycan’s model-line director, Rober Meier, noted to Automotive News that the company is expecting a price “somewhere between a Cayenne and a Panamera.” This means that while the Taycan would likely start at $75,000 (considering that the Cayenne starts at $66,000 and the Panamera starts at $85,000), there will certainly be versions of the vehicle that feature more performance for a higher price. The continuous track testing of the Taycan test mules in the Nurburgring shows Porsche’s dedication in releasing an electric car capable of extended high-speed driving. Earlier this year, Porsche VP of Product Line BEV Stefan Weckbach noted that the Taycan (dubbed the Mission E sedan at the time), would be a track-capable alternative to the Model S, which is impressive in straight line races but handicapped in closed circuits. Porsche also promoted the Taycan as a vehicle that would have a “soul,” just like the company’s other cars like the iconic 911. Porsche has released the specs and features of the Taycan, with the legacy carmaker stating that the vehicle would be fitted with two permanently excited synchronous motors (PSM) that produce a combined 600 hp (440 kW), allowing the electric car to accelerate from 0-60 mph in 3.5 seconds and achieve a top speed of 155 mph. The vehicle is also equipped with an 800-volt battery, which gives the car 310 miles of range per charge. Porsche has further noted that one of the Taycan’s key features would be its charging speed, which could replenish 248.5 miles worth of range in roughly 15 minutes, thanks to a 350 kW charging system. Pre-orders for the Taycan have been opened in the United States, and so far, Porsche has stated that the reception to the upcoming all-electric vehicle has been very positive. The Taycan is expected to enter production sometime in 2019. Watch Automotive Mike‘s sighting of the Porsche Taycan prototypes in the video below.